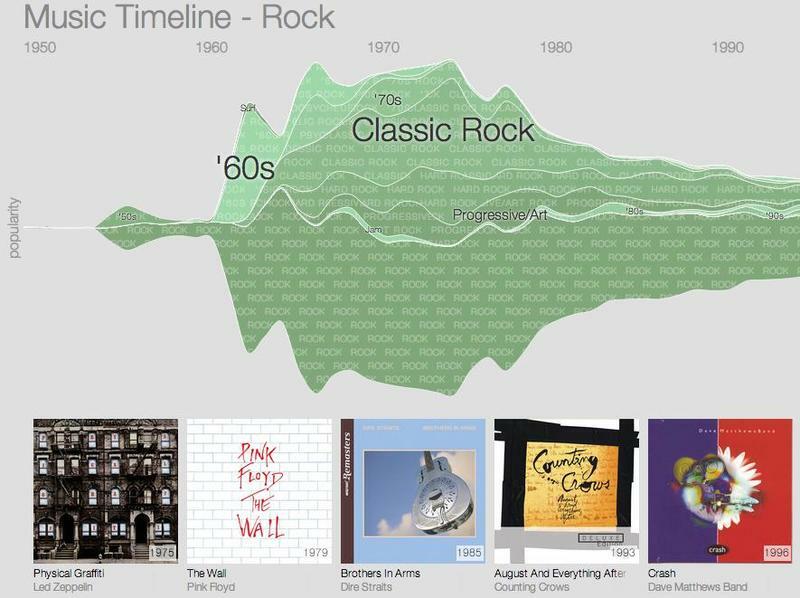 Google on Friday put up a neat visualization of the most popular music genres throughout history, showing which music has stood up over the years, and when a particular genre hit the scene. Rock, Pop and Jazz have all remained pretty consistent throughout the years, while others have kind of… disappeared. Something like Classical surprisingly isn't included in Google's visualization, though you will find genres such as Country, Metal, World and Hip Hop. Sorry Ska fans, but your genre has tapered off quite a bit as of late. Dance, meanwhile, has seen an incredible rise in popularity. The timeline setup by Google is interactive, so you'll be able to see what albums are popular in a specific genre, and what year they were released. In Rock, for example, The Rolling Stones's "Exile On Main St." came out all the way back in the 1970s, yet it's still among many music libraries today. The visualization allows you to see how a particular genre has progressed over time—where it's been, where it is now—along with some of the most famous artists to throughout history. Creedence Clearwater Revival, Leadbelly, Michael Jackson and thousands more. You can even narrow things down by a particular artist, and see when their popularity was at its apex, and when it tapered off. Buddy Holly, for example, who had a tragically short career, was most popular in the late 50s. His name nearly fell off the map in the ensuing decades, but it has recovered in the past few years, thanks in part to Weezer's reference to the singer/songwriter on their Blue Album. If you want to explore the history of music on your own, you can do so by visiting Google's Music Timeline, which of course offers back links to all the albums mentioned in its Play store. It's fun to see how certain genres and sub-genres have spawned and fallen over the years, only to come back even stronger. Even the inescapable Holiday music makes an appearance on Google's chart.